As a matter of fact, I'm pretty sure that at least half of all the business and productivity apps out there were made to help us maintain lists. One of my lists is very dear to my heart. It's my collection of music albums. In the past, it used to be materialised by a stack of cassettes. Then, it turned into a shelf of CDs. Then, it became a list of folders full of MP3 files, stored in the hard-disk of my computer. I've definitely gained in terms of convenience, saving space in my appartment, and reduced fear of losing (or damaging) material records. But what about the pleasure of browsing my collection randomly, while appreciating the beautiful cover art? Lost. Let's solve this. Let's bring back the joy of having a beautiful music collection again! There are many ways to keep an album collection. Firstly, Spotify does allow me to Add an album to my collection, to later find it in the "Albums" page. But unfortunately, this list also includes the album containing each track I've ever liked on Spotify, even though I don't care about the rest of that album... So in the end, it does not really look like a hand-picked collection of albums. So let's ask Google: "album collection online". First result is discogs.com. This website does allow to create a profile and add albums to my collection, with cover art! But it was clearly designed for vinyl disc collectors, as each album is listed in various editions with different track lists, and you have to pick one of them in order to add it to your collection. Too cumbersome for me... Also, I did not find any way to play the album in one click from there. Maybe I should keep my collection in a database, and setup a piece of software to maintain it? A content management system (like Wordpress) with a few plug-ins and a good theme could probably work. But at what cost? I'd need to host it on a PHP server, run software updates, tweak plug-ins and themes that somebody else made, and probably pay for hosting. That seems too complicated. Isn't that the promise of Jekyll, supported for free by Github Pages? That's it! I finally found a good excuse to learn how to use Jekyll! Available online, for the world to see! Easily forkable, for other developers who want to make their own collection. I know that it's quite easy for me to build a HTML+CSS web page that would cover points 1 and 2. I've read that Jekyll can generate static HTML pages based on data files expressed in YAML, which is an almost-plain-text structured markup format similar to Markdown. This could cover points 3 and 4. I also know that Github Pages is my favorite way to publish web pages for free, and that it supports Jekyll out of the box. Meaning that, if I put Jekyll files in my repository, Github will automatically generate the resulting HTML pages. And of course, I can run Jekyll offline on my laptop as well. That will cover points 6 to 8. What about fast search? Oh, wait! I work for Algolia, and one of my colleagues made a plug-in to make any Jekyll website searchable: Jekyll-Algolia! That sounds like a realistic and exciting plan! Let's make this a reality! 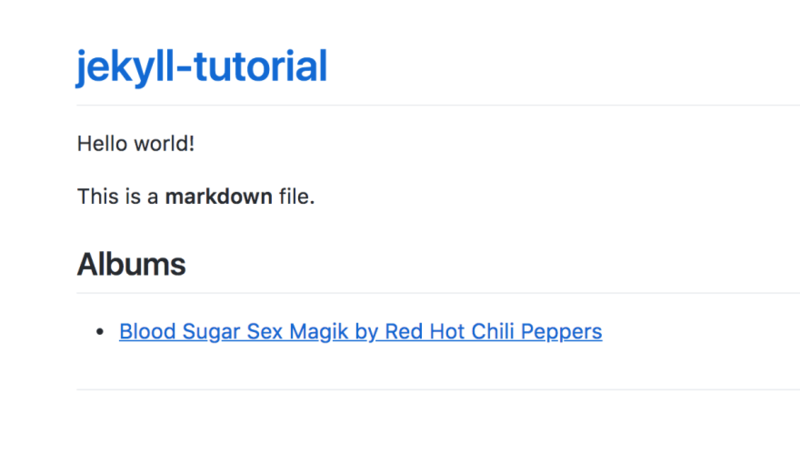 To get started, let's set a simple goal to ourselves: make Github Pages render and publish a HTML file out of a simple Markdown file. I assume that you have a Github repository (fresh or not) ready to host your Jekyll files. If not, please create one and make sure that you are able to commit and push files to it from your computer. 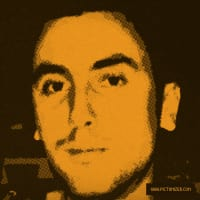 I will follow each step on that one: github.com/adrienjoly/jekyll-tutorial. This is a **markdown** file. Now, let's integrate a simple list into that page. and add a template to integrate its data in index.md. This template will render a HTML list item for every item from _data/albums.yaml. Each item will be render as a hyperlink displaying the title and artist of the album, and linking to its Spotify page. Of course, you can add as many items in _data/albums.yaml as you like! For more information about the syntax of the YAML format, read The YAML Format (Symfony Docs). 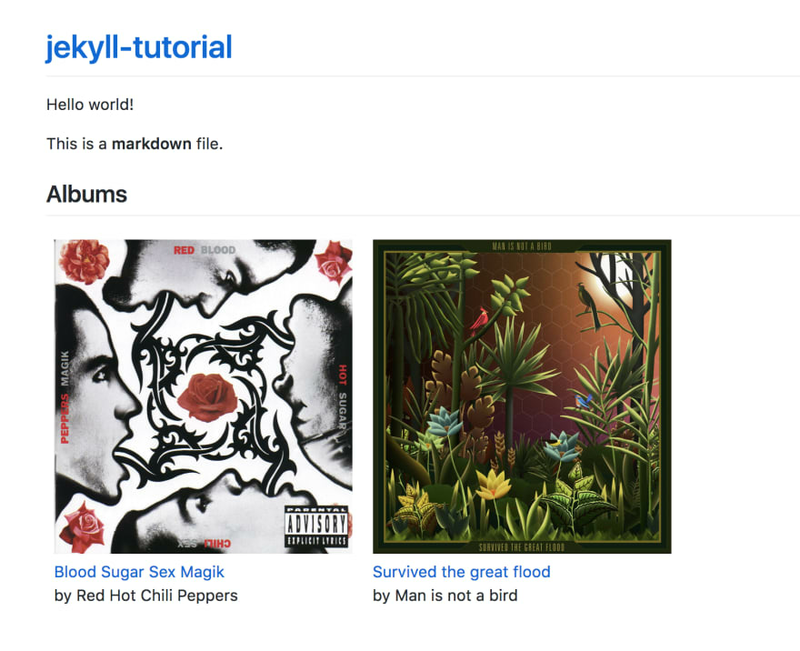 Now that we know how to create a list in YAML, and how to render it in Markdown, let's make it look like a proper collection of albums! The first thing that is missing is cover art. In order to display images, we can of course use the Markdown syntax: ![alt](src). But, in order to get more flexibility while designing our list, we will use some good old HTML instead. 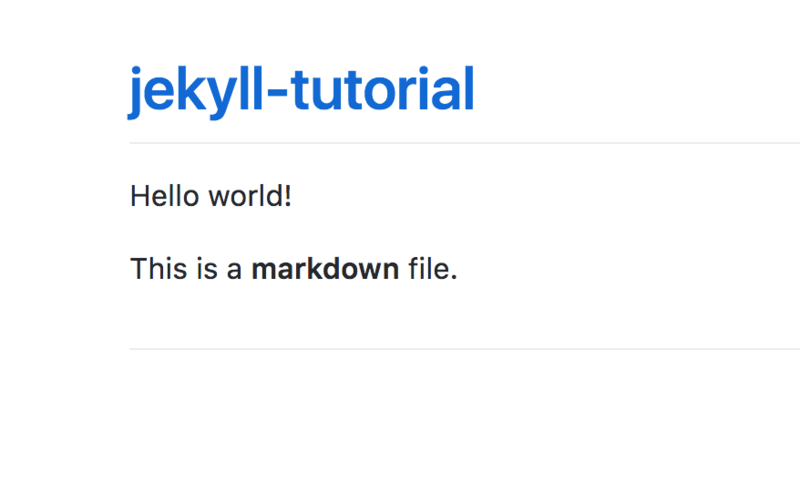 Yes, Jekyll does supports HTML markup in a Markdown files. So what can we do to make our collection ever better? For starters, we have not implemented any way to browse by artist or genre yet. There are many ways to do this, and I'm sure that would make an interesting follow-up to this article! You saw that it was quite easy to maintain the collection in YAML. But we can do better. It would be awesome to automatically populate the album data after typing just its name. Maybe we could achieve that by building a command line interface that would query Spotify's API and update albums.yaml automatically! Search is also lacking. 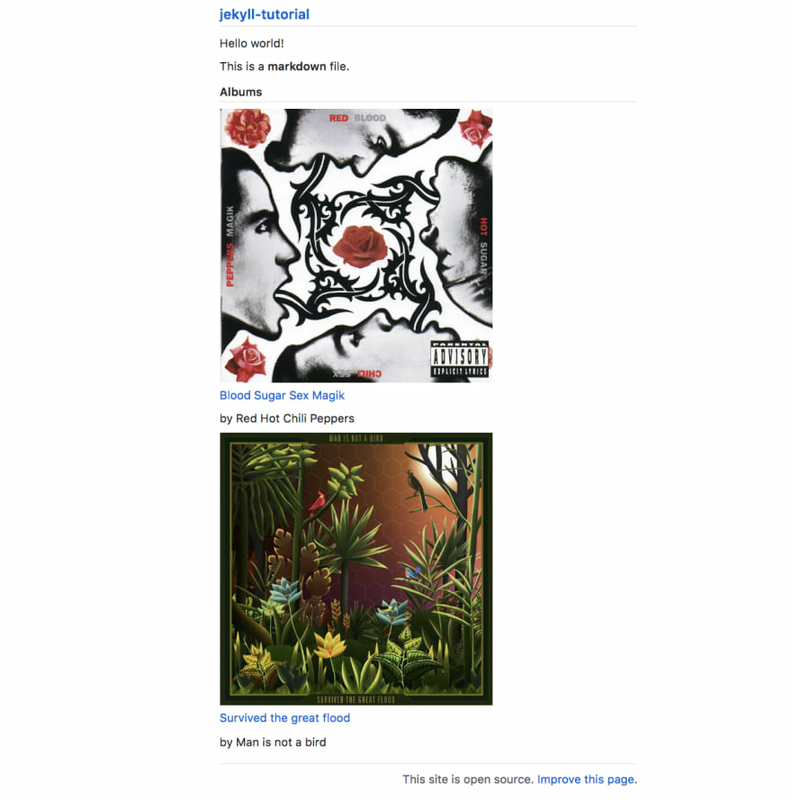 It would be interesting to try out Jekyll-Algolia, as I proposed earlier. One more thing: what if I want to use my album collection while being offline? Worse, what if Github Pages dies? Can we run Jekyll ourselves, to generate the HTML website from our index.md template and our albums.yaml data file? Yes, we can! 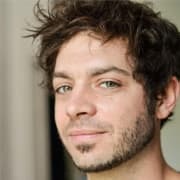 We just need to setup some software tools on our computer, and add a little bit of configuration to the Jekyll website. That's yet another topic that we can explore together in a next article. 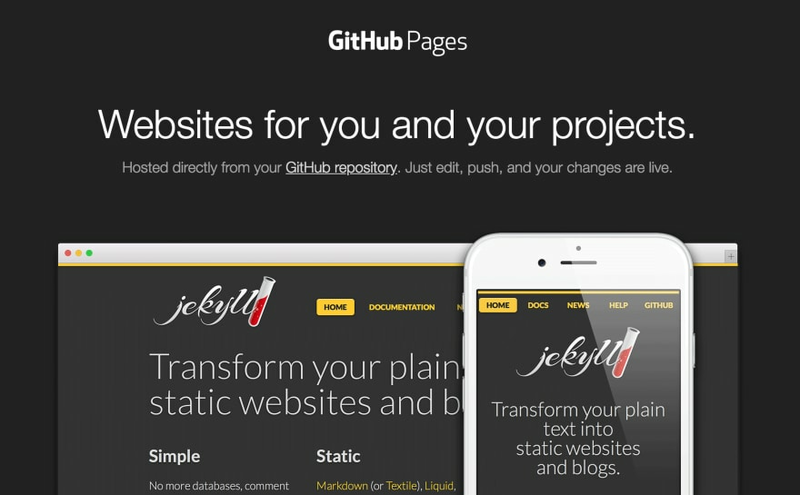 I hope that this article convinced you that Jekyll and Github Pages make a powerful (yet easy to use) duo to maintain beautiful and flexible lists online. As a lover of the Web, I wish that more lists were maintained that way, and that we rely less on closed apps to hold our data. This article aims to be a modest contribution towards promoting the DIY (do it yourself) philosophy to the way we manage our lists of things, and more generally, our data. I'd love to read your feedback, ideas, and suggestions after reading this article. Please let me know what you'd like me to write about next! Oooh interesting, good work! Been thinking about making something like this as a weekend project (realistically over multiple weekends), unfortunately never got around to doing it.